When it comes to the functioning of a motor vehicle, few things are more important than the fuel tank. The fuel tank provides the vehicle with the means of storing gas, its key ingredient for operation. Because fuel is highly flammable, it is important that the fuel tank is able to withstand the force of a sudden accident and resist tearing. 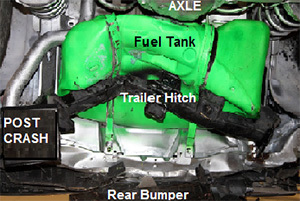 A torn fuel tank can quickly lead to a fuel fed fire, an incident which can cause severe injury or death for passengers. At the Willis Law Firm, our experienced legal team is committed to helping victims of fuel fed fire accidents seek the compensation for their injuries they need. If a poorly manufactured fuel tank lead to a fuel fed fire that caused you or a loved one injury or death, we may be able to help you in bringing that company to justice. Contact our offices today at 800-883-9858 for more information. Fuel tanks must be both resistant to punctures and tears and placed in a position in the vehicle which reduces the chances of it being damaged during an accident. Unfortunately, many fuel tanks are inadequate in one or both respects, a factor which contributes to the nearly 300,000 fuel tank fires in the United States every year. Out of those, approximately 400 fatalities occur each year from fuel tank fires. Whether the tear is caused by a rollover crash or a rear-end collision, tears in the fuel tank are a serious problem that no vehicle should be vulnerable to. Vehicle manufacturers are obligated to take the necessary steps to ensure a solid design and production of fuel tanks in order to protect their consumers from this potentially devastating harm. If you or a loved one was involved in an accident with a fuel fed fire, the Willis Law Firm may be able to help you seek the compensation you need for medical bills, pain and suffering, and other expenses. To speak with a skilled legal professional today, contact our offices at 800-883-9858.